Although not planned, this month I have bought a couple of MN dive watches which I will debut here soon. As usual, this opened up a whole new world; interpreting MN decom' papers. According to Konrad Knirim, the watches were worn by three branches of the MN, plongeurs de bord, plongeurs demineur and nageurs de combat. Translated, these mean ship's divers (not training as suggested by Konrad), clearance and lastly, commandos. I have seen quite a few decom' papers for ship's and clearance divers but the only papers I've seen for combat divers' equipment are for a wrist-worn depth gauge. Has anyone these elusive decom' papers for MN combat divers' watches? Thierry? I think Laurent (if he posts on here) knows a thing or two. I actually did the Plongeur De Bord (the French Navy Ships diver) course at St Mandrier (outside Toulon) in the eighties; Cousteau Mistral Gagnants, wriggling through anti-submarine nets, lots of palmage and all that good stuff. It was run by a great bunch of Navy (MN) guys who had a refreshingly laisser-faire attitude after the strictness of the army! At the time I did it we were lucky in having a few guys down from the GIGN who were doing their combat swimmers course (Nageur de Combat), very relaxed unassuming guys who were more than happy to have a few beers with a dull old squaddy like myself. I also did the French army divers (CTE SAF) and dive team leaders (CT1 SAF) course in Valbonne (outside Lyon), this was more rivers and lakes than the sea and the main mission was river bed profiling for tank crossings. The army equivalent to the Nageurs de Combat were the guys that did IO (Infiltration Offensive) which the SAF courses are a prelude to. The Nageurs de Combat and the IO were the ones that had the O2 rebreathers and good memories! Closer to home I did the Reconnaisance swimmers course at regiment, although this didn't involve diving, we had great fun jumping out of helicopters and parachuting into the sea - in the summer if the wind was right you could get 'accidentally' blown onto the beach (which was very dense with girls), thinking you were like James Bond (but actually just like someone whose got blown onto the beach attached to a big wet sheet!). 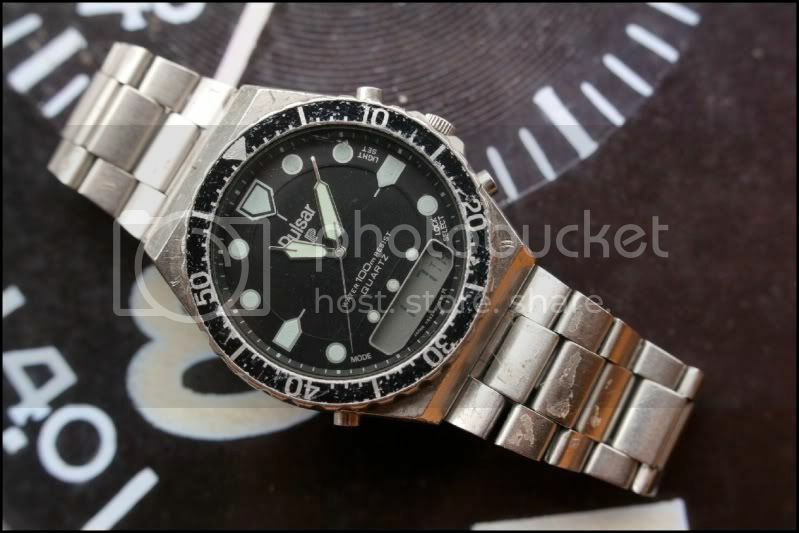 I was never issued a watch (and can't remember anyone who was) but we weren't mainstream day-to-day divers; I had an old Seiko Sports 100, same as the Gen 1 military but the civilian version), and that did me fine. Anyway, I digress, good luck with your finds! Well I didn't expect such an interesting answer, Andy, digress as much as you like! I hope you are coming to the next GTG and we can twist your arm for a few stories? Can you remember what type of watches the French instructors were wearing? Is this like your Seiko? 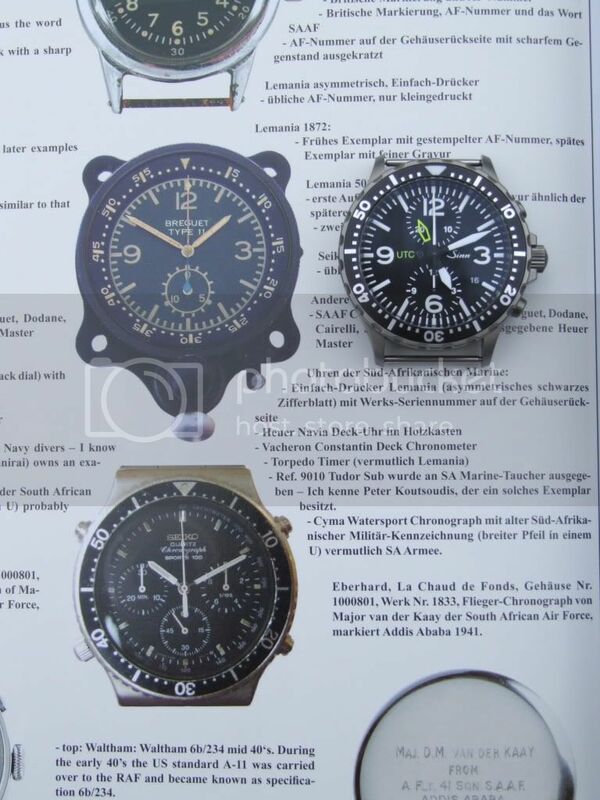 These were issued to the SAAF - the commercial pilot who delivered my SAAF Lemania 5012 to me was wearing the one he was issued whilst on National Service. Nemo has one too - I think he wore during flight training? Thanks - yes, that's the one (I'll post a picture when I get home next week), it's very battered and bruised and in need of some TLC, but I'll keep the bezel in all its dinged glory to tell its own tale I think. I knew that a version was issue (without the bezel) but that's interesting to see the bezelled one was issue as well. Mmmm, not a bad choice for a young pup at the time (pre-internet information age too!). I've read somewhere that this was the first quartz chrono movement but haven't been able to look too much into that yet. I can't honestly remember what the instructors wore (how little we know when we're young!) but I know that the Citizen Aqualand/2000(?) was worn by a few guys on the courses but the most popular back in the regiment were the Rolex sports models, GMTs and Submariners. During one particular tour in Central Africa about 4 of the Rolexes went wrong or developed problems much to everyones chagrin. In retrospect I think this was just a very flukey coincidence but it put me off for years. (They all got sorted by Rolex obviously; one of the Swiss guys took them home on leave and got them done in a few days - it may have been his menacing glare!). When I finally managed to qualify for civilian life I eventually got myself an Explorer II despite myself and couldn't have been happier - not a jot of a problem for ten years solid wear. I still do a lot of running (doing the marathon des sables again this year) and so the EZM1 is my daily at the moment, superb and perfect design for run timing. This French issued Pulsar looks very vaguely similar, if you ignore the dial and hands then squint!? Last edited by StampeSV4; 02-02-2010 at 14:14. It does a bit! It's in pretty much the same state as well. I'll update with pics over the weekend hopefully. I take it the Pulsar is a variant on the Chronosport UDT/Breitling Pluto? Thanks Alistair - I've sucked a lot of info out of you chaps so glad to be able to recipricate in some small measure. The Explorer II isn't really a classic I'd say, and knowing what I know now I'd perhaps tend towards something else, but it's one of those watches that just fits into any circumstance/dress and it's been a faithful companion for ages. We office bound gents appreciate them.